Thank you for your submissions! Vote for... hm, guess the title never got fixed. Well sure, vote for your favorite! As a sad aside, I'm not sure if I'm going to run any more proper contests. I'm super happy with the programs and effort, and the winners of this one will of course still receive prizes. However, considering the turnout for a contest people apparently really wanted to have, I can only assume future contests will have even less, and 6 entries really is about the minimum I'd be willing to give out prizes for. #162 ✎ 278 ProKuku QSP Contest 1 Contest Participant I participated in the first SmileBASIC Source QSP Contest! As a sad aside, I'm not sure if I'm going to run any more proper contests. I'm super happy with the programs and effort, and the winners of this one will of course still receive prizes. However, considering the turnout for a contest people apparently really wanted to have, I can only assume future contests will have even less, and 6 entries really is about the minimum I'd be willing to give out prizes for. Would it be possible to hold future contests with no prize money, but rather a special badge or something else on the website as a prize? An idea I have is that there could be a tab in the submissions section of the site dedicated to the winner and runner-up of each contest, so that their program would get featured more on the home page (maybe a specific window on the home page to feature them on?). However, I’m not sure if this would be enough to motivate people to try and make a game. #169 ✎ 180 Nathaniel OSP Contest 1 Contest Participant I participated in the first SmileBASIC Source OSP Contest! OSP Contest 2 Contest Participant I participated in the second SmileBASIC Source OSP Contest! OSP Contest 3 Contest Participant I participated in the third SmileBASIC Source OSP Contest! 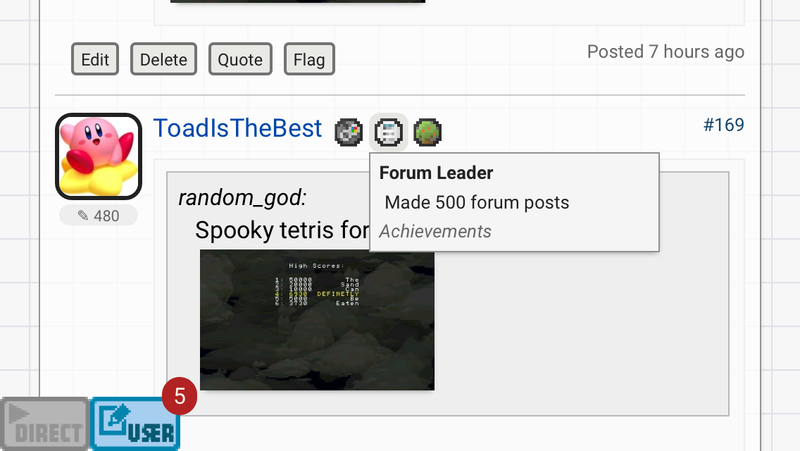 Wow I just got that badge! I think the badge counts the deleted posts as well while the counter doesn't. Or maybe it's just because he spams the website..? Obvious answer? #173 ✎ 278 ProKuku QSP Contest 1 Contest Participant I participated in the first SmileBASIC Source QSP Contest! I find it confusing that their notifications are an octagon, too. Oh. Nvm, it shows up as an octagon on my 3DS. Would a TikTok port had been a good submission for this contest? What the heck are you even talking about?